'Twas the night before Christmas, and it was very quiet in Mrs. Muffet's house,—altogether too quiet, thought little Miss Muffet, as she sat trying to eat her curds and whey. For Mrs. Muffet was a very severe mother and had her own ideas about bringing up children,—and so had Mr. Muffet, or rather he had the same ideas, only warmed over. One of these was on the necessity of care in the diet of growing children. 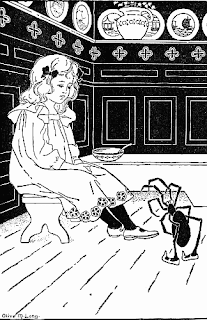 "First," said Mrs. Muffet, "we must find out what the children don't like, and then we must make them eat plenty of it; next to breaking their wills, there is nothing so necessary as breaking their appetites." Mrs. Muffet had read this in a book, and so she knew it must be true; and Mr. Muffet had heard Mrs. Muffet say it so many times that he knew it was true. 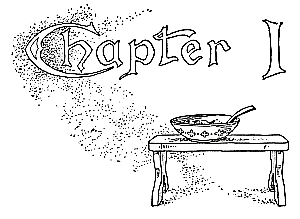 So every morning little Miss Muffet had three courses: first, curds and whey; second, whey and curds; third, curdled whey. She had the same things for the other meals, but the order was changed about. An experienced housekeeper tells me that the third course is impossible to prepare, as whey cannot be curdled. All I have to say is that this housekeeper had not known Mrs. Muffet. Mrs. Muffet could curdle anything. But the worst days of the year for little Miss Muffet were the holidays, for they were occasions that had to be improved. Now for a little girl to improve an occasion is about the hardest work she can do, especially when she doesn't know how. If she had been left to herself, Miss Muffet wouldn't have improved them at all, but would have left them in their natural state.